In celebration of 100 followers I am throwing a PARTY!!! I think we can all agree that the BEST part about teacher blogs is sharing AWESOME ideas. Who doesn't love a FREE activity to take back to the classroom? This is my first linky party. I'm a little nervous, because I don't want to throw a dud party. I hope each of you will participate and share a FREE idea with everyone else. Just imagine all the goodies you'll have to start the new year. I'll get the party started. Math About Me is an activity I've done since my first year teaching. My teaching mentor, Ms. Corretti, showed me this idea and I loved it. 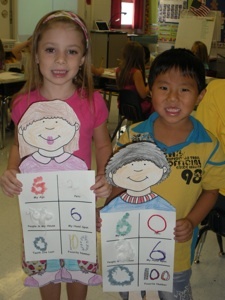 Each child will receive a head (boy or girl), body, and feet. (There are no arms. They get in the way of hanging. Although, I did them one year and put the each child's phone number and address on them). I generally have my kiddos complete one or two squares each day during the first week of school. I show them how to write their number as large as possible to fill up the box. Then, I find any type of art supplies to decorate the number. I normally use stickers, yarn, stamp ink, sometimes glitter if I'm in the mood, sequins, etc. These turn out really cute to hang up for Open House. I also use this activity to jump right into class graphs (age, teeth lost). Click here to download this activity for FREE. Everyone has probably seen or played "I Have, Who Has?" before. I wanted to create a cuter version of the same game to play when we discuss skip counting. 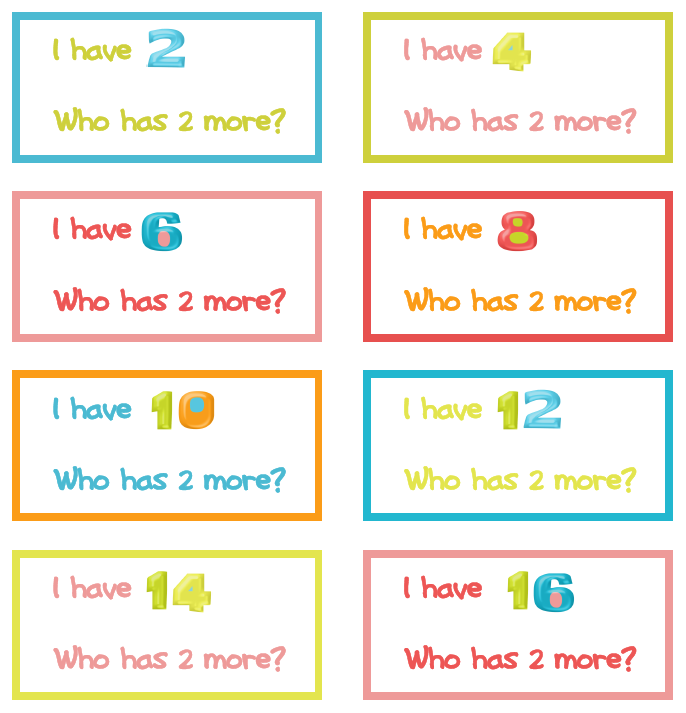 I made a version for counting by 2s, 5s, and 10s. 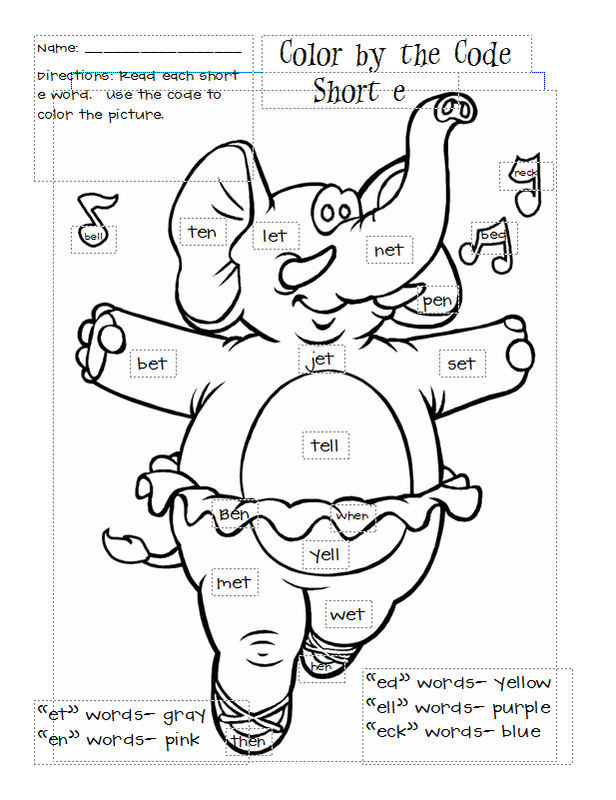 In need of short vowel Word Work activities? 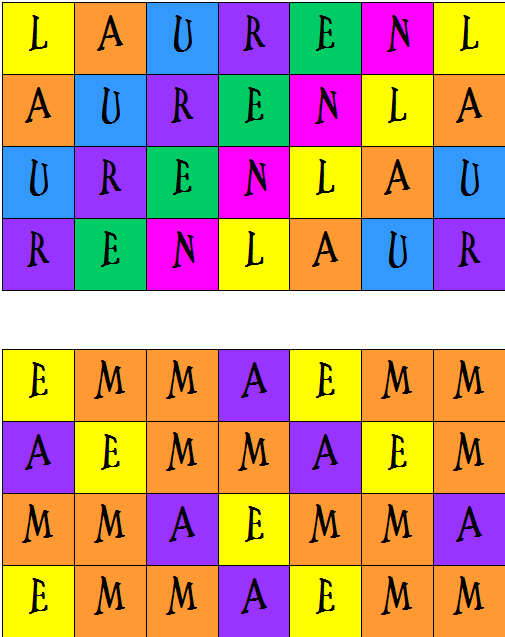 Here are some color by the code pages to help your kids visually discriminate word families. Thanks for following me- love your site and I am now a follower too! I will join your linky party but I have to think of an idea and it is too early still! I will be back! Can't wait to see what everyone shares, thanks for hosting! Best linky party out there! Who doesn't LOVE a good FREE idea--especially for the start of school! I'm now a follower! I need to tweek my freebie and upload it and then I'll post it and blog about this great PARTAY on my blog!! Congrats on 100 followers..isn't this fun...and addictive..my husband says he loves that I love to teach and do all of this...but can we talk every once in awhile..I need to prioritize better I guess! But I'm so addicted to blogging!!! Will add link shortly! Heather- thanks! Can't wait to see what you come up with. Amanda-- thanks for the kind words. I was a little afraid to host a party. But, hopefully we'll have lots of great ideas by the end. Erica-- My husband just doesn't understand my blogging obsession. I ran him out of the room last night just so I could read in peace and quiet! I also need to learn how to prioritize. LOL...that's too funny! Well my tens frame from Unseen at Proteacher aren't the cutest ones..but check them out they are very practical and great for the kids at 1st and 2nd grade levels! Hey Lauren! I'm so glad you are doing this! I'll have something to post in a bit. I'm so excited to see what everyone puts up here! Thanks lots for hosting! Congrats on your sassy blog and 100+ followers!! I'm one of them. I can't wait to read more. Just linked up! Whoo hoo.. this is so neat. I am a teacher in training and love all the ideas I'm seeing. I can't wait to have some of my own to post one so I can borrow! Thank you for hosting this! AWESOME!! Thank YOU for the linky party. It will be great if we can share the link code. It is an amazing list of wonderful resources. TPT better get fixed soon! Thank you for having this link party. It is great being new to First Grade. Just like what Kinderpond was saying TPT is not working this evening. They usually have these up and down days. I will try back in a few hours. Again thank you ! I am super stoked about this linky party. What a fabulous idea! I just linked up a few hours ago. Have a great holiday! I just tried to go to TpT and see what the problem is, but the whole site is down now. Hopefully they'll get it fixed soon. Oh my gosh! So much more has been added since yesterday! Way to go Lauren for this great idea! Happy 4th of July ! I checked out TPT again last night after we got home from fireworks and it worked. Since I do not have a blog to share free stuff yet. Again thanks for having the link party. I love your blog and look forward to following you. I teach a lot of classes in my school district and I am always looking for great links and resources to share with the K-2 teachers I teach. Your blog will be on my list of favorites. Thank you for the comment. Trish, I'm glad you tried again and it worked this time. Maybe they were overwhelmed with all of the Fourth of July sales?? Linda, You are so sweet! Thanks for your kind words. I am having a blast learning how to blog. I already submitted a freebie, but wanted to let you know I just started a "Lots of Linkies" Linky on my blog to help manage all the linkies in blog world. You might want to hop on over and add yours and help spread the word. Thanks so much for your math about me freebie. I saw an assignment for an older grade and was trying to decide how to rework it for my little ones. I just found your blog. I'm your newest follower. GREAT ideas! I LOVE the Math About Me. Thanks for sharing. I missed you linky party for sharing freebies. Great idea. But you can stop by my blog for lots of freebie too. Hi! Just found your blog tonight and I love it! I found some great freebies too...just sorry I didn't find it in time to add one to it! I'm a new follower. Anyway, I'd love for you to check out my 1st Grade blog Simply SWEET TEAching. Love your blog! I have a question... What does "My Hand Span" mean on the 1st freebie that you posted? Hi Jennifer! I have the children spread their hands as wide as they can, and then measure from the thumb to the pinky. I have to help many with the ruler since we complete the activity during the first week of school. Thank you! I thought that was what you did, but just wanted to check! These are GREAT! I am teaching grade 1 for the 1st time in about 10 years...thank goodness for the internet and people like you.